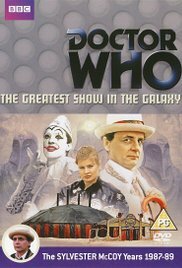 In an anniversary season that featured the return of the Daleks and Cybermen sandwiched around a piece brutal political commentary, it’s easy to forget that ‘The Greatest Show in the Galaxy’ is the concluding serial and just as important as any of the others, though for wholly different reasons. Instead of playing on nostalgia to cater to the fans, the serial instead wholly directs its focus inwards at what Doctor Who in general had become at the time after years of public pressure had slowly tempered the audacious and surreal imagination originally on display. As Doctor Who continued its fight for its very life as ratings continued to plunge, ‘The Greatest Show in the Galaxy’ is a biting and grim look at the 1980s era in general and the impossible situation it found itself in no matter what changes it made or stunts it employed. Without question, the family comprising the audience of the Psychic Circus that determines which acts survive or perish is the most overt metaphor within the serial, showcasing the struggle and sacrifices made to ensure the BBC’s approval of and continuation with the programme as a viable franchise. As Captain Cook points out, the goal is not necessarily to challenge conventions nor to experiment too much with format and style but rather to simply entertain and survive. It’s quite telling that, even with the intent of visiting the Psychic Circus and its famed acts, the Doctor and Ace must still attempt to appear like average citizens rather than hippies or performers in order to remain on good terms with the locals. Fittingly, although the Circus was founded on the principles of creating a place where individuals could express their individuality, by the time the Doctor and Ace find it that idealism has been long lost, commercialism and standard procedures of operations instead dictating the performers’ way of life. With the rather grim outlook regarding individuals who sell out and become complicit in more organized schemes as well as the presence of the judgmental Gods of Ragnarok, ‘The Greatest Show in the Galaxy’ carefully lays blame on both internal and external forces for the current state of affairs. The Ringmaster makes it clear that intergalactic fame and fortune will come once more if the Circus continues on as it is, but his American tropes also allude to the ever-increasing attempts of producer Jon Nathan-Turner to get Doctor Who to break through overseas rather than relying on the British public alone. Of course, the serial hardly treats Doctor Who’s most obsessive fans with any dignity or respect either, Whizzkid filling that role as he retains an earnest enthusiasm for the Circus while admitting that he knows it isn’t as good as it used to be without even having experienced those same past successes. Having such a keen youngster so brutally killed off by the heroes he so clearly worships as he becomes just another sacrifice is quite shocking and speaks volumes even if the character is portrayed at least somewhat sympathetically. Concurrently, the serial also brings Captain Cook’s rather pointed desire for survival at the expense of others as well as his companion’s rather generic role without any real development to the forefront, both of which can be extrapolated and applied respectively to the characters of the Doctor and any number of his companions over the years as well. Still, the story does portray both the Doctor and Ace quite brilliantly, and not just for refusing to accept the status quo in order to ensure survival. Though seemingly superficial, Ace is afforded the opportunity to work through her fear of clowns, a major bit of character development that many companions do not get to experience. Likewise, it’s clear that the Seventh Doctor is continuing down his more deliberate path of intervening in affairs, expertly highlighted by his juggling in the opening scenes. Intriguingly, though, the Doctor’s shrouded past is again alluded to here as it seemingly intertwines directly with that of the Gods of Ragnarok, further instilling a grand sense of mystery to a character twenty-five years old. ‘The Greatest Show in the Galaxy’ is hardly the stereotypical story that would be expected in an anniversary season, but its willingness to condemn behind-the-scenes choices while tearing apart the past in order to bring about its continued survival is a fascinatingly surreal notion that works incredibly well.